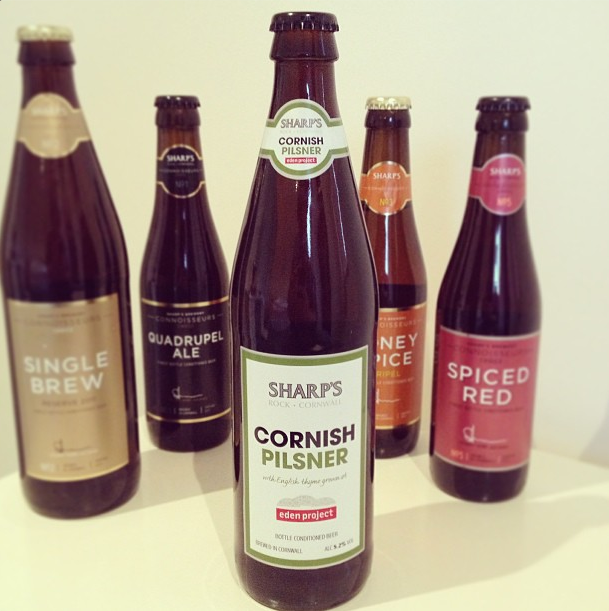 Sharp’s Brewery launched its Cornish Pilsner last summer (August 2012), in collaboration with the Eden Project – and I finally got my mits on it a few months later during a trip to Cornwall and a visit to their brewery – which after an extended amount of tasting ended up costing me quite a lot – as I left with a boot full of goodies – including some fantastic glassware! I’ve always been a fan of their more creative beers – and for years have enjoyed those first craft beers that the created with Rick Stein back in 2006 – in particular Chalky’s Bite (with that delicious warm alcoholic fennel flavour) – so I was looking forward to trying their very traditional Pilsner – one of my favourite types of beer. Being traditional, Head Brewer Stuart Howe had used whole Saaz hops and Czech lager yeast to create this brew – alongside some thyme grown at the Eden project – helping to stamp their own mark on this classic beer style. At 5.2% ABV it was also a little stronger than some pilsners – but this didn’t seem to affect the balance. On pouring it was very light and pale and gave off lovely herbal and lemon zest aromas – with a light head that dissipated slower than others I know. The flavour was crisp and refreshing with zest and spicey bitterness that all ended in a perfectly carbonated pop – it was very drinkable and would go very well with warm weather and grilled food. For me though, it’s not quite up their with my current favourite pilsners – including Little Slow from the Little Beer Corporation. However it’s worthy of a 3 star rating – but I have no idea if it will still be available this summer as it’s not part of their usual lineup.